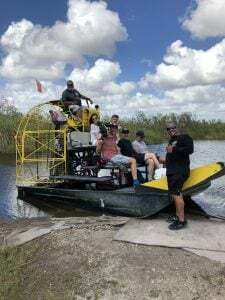 Airboat In Everglades, considers all of our guests as VIP, but once in a while we like to highlight our special guests that are known from places all over the world. Max Emilian Verstappen is a Dutch racing driver who competed as the youngest driver in Formula One with Red Bull Racing. Check out his adventure with us HERE. Miray & Tolga ÖNCÜ (Instagram- @keyifliyim) are top notch Instagram influencers. They broadcast their luxury travel adventures to their 116K+ followers and recommend the best places and activities wherever they travel. Check out their adventure with us HERE. Sel (Instagram- @Seloupe) is an Instagram influencer based in LA/NYC/MIA. She shares her travel journeys with her 100K followers and uses her platform to spread interesting facts about the places she goes. Check out her adventure with us HERE.